Artist Timothy Leo Taranto combines literary greats with literally great puns (???) to create a series of delightfully goofy drawings. Featuring Vonnugget (yum! ), Ernest Lemingway (ha! 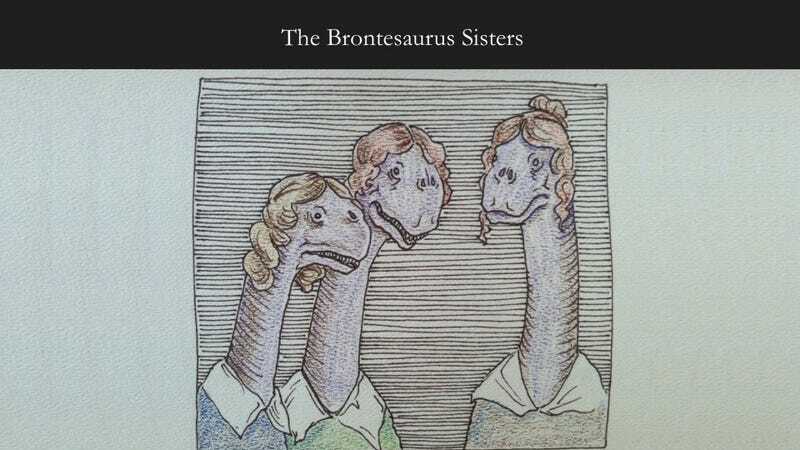 ), and, of course, the ever lovely Brontësaurus sisters. It's a dad joke in art form, and I'm nerdily all about it. I'm thinking if Taranto wanted to do a series, her could expand the dino-puns to include some of the sisters' important works. Charlotte's Jane Eyre, Emily's Wuthering Heights, and Anne's The Tenant of Wildfell Hall are all ripe for someone punny to rip into. As for me, my brain is collapsing in the face of (typhoid??) fever, so I'll leave it to you, dear readers, to captivate the mind and hearts of pun lovers everywhere. As for me, I'm headed to the dino-store to pick up some cold meds.